There are many myths surrounding high altitude baking. I found the following to work well when adjusting recipes to higher altitudes. Please keep in mind when adjusting your own recipes, that it may take a trial or 2 to get them as you remember. Make sure all fresh produce is cleaned before using. Always clean using luke warm water, not hot or cold. Do not increase the temperature; instead bake according to the directions given. The only time that a given temperature may effect the results of a baked product is when you are directed to bake at 400°F or 425°F. If you come across these listed temperatures in a sea level recipe or cookbook, decrease it by 25° F in higher elevations. This will prevent the outside from over baking and drying out, before the center has a chance to catch up in temperature. Allow the product to bake just a few more minutes than directed. If baking with a crust or crumb topping, and it appears to be browning too soon, simply cover it with a piece of tin foil and continue baking until fully baked. All ovens cook and heat differently. Therefore always check your product for doneness prior to removing from the oven. To do this, insert a toothpick or knife into the center of the baked good, if crumbs are attached once utensil is removed, then it needs a few more minutes to bake. 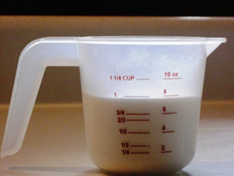 Add an extra 1.5–2 rounded tablespoons of flour per cup; if above 10,000 feet add 2–2.5 tablespoons of flour per cup. Add an extra 1.5–2 tablespoons per cup of liquid, (not oils); if above 10,000 feet add 2–2.5 extra tablespoons of liquid. Decrease sugar by 2 teaspoons per cup, above 10,000 feet, decrease by 1 tablespoon per cup. If you want, add 1/4 teaspoon of salt to every baked good. I do not use salt but some say it helps with leavening. 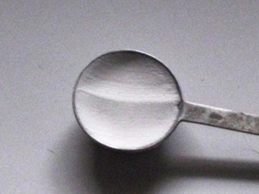 Many say to decrease the baking soda and baking powder by 1/4 to 1/2 teaspoon per teaspoon. I do not. Instead when I am leveling the measuring spoon, I slightly indent my finger into the powder. However, if above 10,000 feet then yes, definitely decrease the leavening agent by 1/4 teaspoon per teaspoon. Only use large–extra large eggs! The old way for adjusting recipes to higher elevations, was to add an extra egg. I have done this more times than I can count. For example if a muffin or cake recipe from a basic cookbook calls for 3 cups of flour, but only 1 egg, add 2 eggs. If using frozen fruit, add at least half of the juice after thawing to assist in adding moisture to the product, especially in muffins and sweet breads. Always grease a baking pan thoroughly. 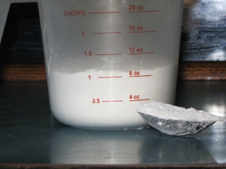 If dusting with flour after greasing, use as minimal of an amount as possible. Use fast rising dry active yeast, not instant. After mixing, thoroughly grease a different bowl, and place the dough into the greased bowl and cover to rise. The dough will raise best if placed in a warm, moist environment. Most yeast dough’s will take 45-60 minutes to double in bulk and then follow directions accordingly. One of the most difficult aspects in high altitude baking is retaining the moisture in a baked product once fully baked. In more humid environments many will want that excess moisture to escape, but when baking at high altitude, where the atmosphere is much dryer, you will want to retain as much moisture as possible. Therefore, upon removal from the oven, wrap/cover in cellophane, or place the product in a plastic container or baggie within the first 3-10 minutes after removing from the oven. For all muffins or sweet breads, remove the product from the pan within the first 2 minutes to prevent further baking. Do not use tin foil when storing fresh baked goods, unless indicated. If storing in a tin can, line sides and top with waxed paper or cellophane, and make sure that the lid fits tightly! Do not store fresh baked good in the refrigerator unless indicated in the recipe. Most baked goods can be frozen if handled properly. To freeze a baked good, wrap generously in cellophane and then place in a freezer designed plastic baggie and freeze up to 1 month. Thaw completely before serving.